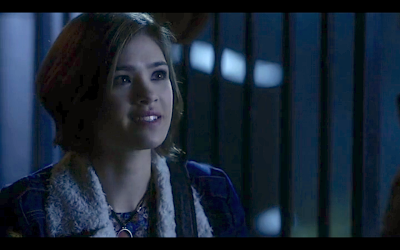 CATCH OF THE DAY: There could not have been a better opportunity to introduce Miranda, the main character of ABC Family's new show Ravenswood, than in the Pretty Little Liars Halloween special, "Grave New World." Why, you may ask? Well, because even though you might recognize the episode title as a pun of Aldous Huxley's famous novel, Brave New World, the book actually gets its title from the dialogue of a character named (you guessed it) Miranda in Shakespeare's play The Tempest. Hey there, Miranda. We're sure you're going to "prospero" on Ravenswood. In Shakespeare's The Tempest, Miranda grew up isolated, only knowing her father and the spirits (both light and dark) of the island she inhabited. It shouldn't come as a surprise then that Miranda was the name chosen for Ravenswood's main female lead. She too, grew up the modern, small-town teen TV drama equivalent of isolated: her parents are dead, she has bounced around from foster home to foster home, and she is linked to a curse that ties her to Ravenswood. 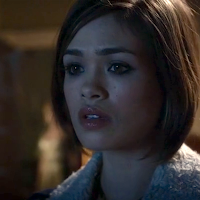 Also, Ravenswood's Miranda seems to have a similar propensity toward the mysterious. Take, for example, the scene where she places her hand on Caleb's forehead in order to "keep evil spirits away." In fact, Shakespeare's Miranda's father, Prospero, is a magician who is placed in opposition to the evil witch Sycorax. Mystery runs in Miranda's blood, but if The Tempest is any indication, our new Ravenswood heroine is definitely on the winning side. We can't wait to see how this drama plays out.